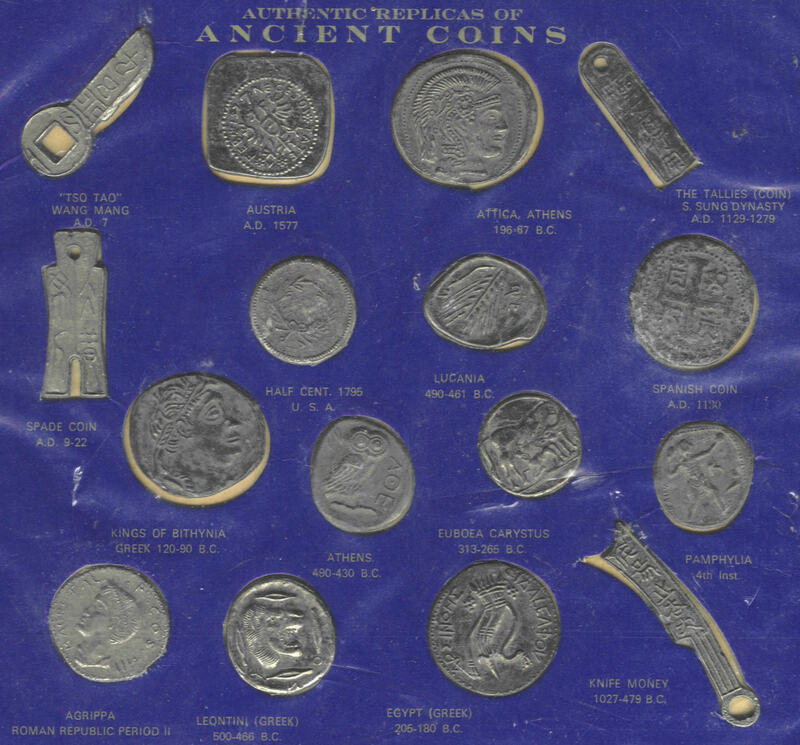 Collectors and members of the general public occasionally ask about ancient or mediaeval coins that they have discovered, and are either mystified that they cannot find them in any of their catalogues, or think they have stumbled upon something highly valuable, as the case may be. Known at school as a keen collector, I was once shown pieces that purported to be Ancient Chinese knife coins, but they seemed oddly small and of a strange colour. I didn't have examples of the real thing at the time, but had a vague idea from my reading as to what they should have looked like. A couple of years later, a junk tray turned up what looked like a Roman Republican As of Agrippa; the size was about right, but the colour again was wrong, and the lettering looked too thin for the period. For six cents, I figured it was worth it as a curiosity, all the same! It was only about fifteen years later, in the mid-1990s, that the mystery was solved. I was given a cardboard sheet containing what were described as "Authentic Replicas of Ancient Coins", made, as readers may have guessed by now, in Hong Kong. Because these items do occasionally turn up separated from the board for which they were originally produced, I propose to give a description both of the original board and the various items on it, so readers will know what they are if they are ever presented for identification. I shall describe only the "visible" side from the board display in cases where I don't have a duplicate of the item that I can turn over. The board itself, SHOWN HERE, is dark blue and measures 223 x 200 mm. There is a decorative gold border (not shown in the illustration) and recessed holes for sixteen "authentic replicas", as described below. All of the items are in white metal, and appear to have been cast. The titles are taken from the board, and are in a number of cases are either inaccurate or so vague as to be pointless. This piece is in the shape of a key, with a square hole in the head, and four "seal"-type Chinese characters along the barrel. It copies a piece issued under the Emperor Wang Mang (about AD 7 - 23), who reintroduced archaic coinage forms, such as key and knife money, during his brief reign. This piece is smaller than the original, at 40mm. This piece reproduces a "Klippe" piece, and is again too small, at 34mm across the diagonals. The "coin" part shows a very crude imitation of the Austrian eagle, with the legend NECESOI TATE FEB 1577, broken by floral elements. Too crude to deceive anyone, I think. 3. ATTICA, ATHENS 196-67 B.C. This could fool the untrained eye. 34mm Helmeted head to right. No legends. The hairlines and lines on the helmet are rather crude. 35 x 10 mm, rounded head, with a small hole. Five characters on each side of the piece. Looks like a tally, but I have never seen any Southern Sung pieces like it. Like the "key" coin (No. 1), this imitates one of the "throwback" pieces issued under Wang Mang. The real thing is bronze and over 60 mm long. This measures 38 x 14 mm. 6. HALF CENT, 1795 U.S.A.
Why a 1795 half cent is considered Ancient, I'll never know. The colouring is wrong and the lettering too wiry and extremely faint. 24 mm. Oval, 27 x 21 mm. The visible side shows an ear of wheat and two letters, resembling a reversed J and F.
27-28mm. The visible side shows a cross in a dotted circle, with crude imitations of the lions and castles found, for instance, on 18th-century Spanish bronzes. When inverted, the castles look like bold Ms. The side against the board shows very crude pillars, with lettering running off the side. The visible letters read ... EX. ANO 1130. The date could easily be confused for 1730, 1750 or 1756, especially given that the type of coin that it imitates is far later than 1130! 9. KINGS OF BITHYNIA, GREEK 120-90 B.C. Oval, 31 x 28 mm. vLaureate male head to R. Fairly crude lines. No legends. The reverse (not shown) appears to show a standing figure holding a staff. Oval, 26 x 22.5 mm. Copies an Athenian "owl". Owl and AOE legend (dot inside the O, i.e. theta). Could fool the untrained eye. 11. EUBOEA CARYSTUS 313-265 B.C. 23mm. Bull to R, turning head back toward L. Human figure? below. Could fool the untrained eye. I have no idea what 4th Inst. means here. Oval, 26 x 22 mm. Standing figure adopting a fighting stance, maybe throwing a discus? Letters EAUY at L. Two smaller figures (bird/weapon, dog?) in the field at R. Could fool the untrained eye. Laureate male head to L. Hair lines are too crude, though worn specimens may be more convincing. AGRIPPAL . F . COS . III . Reverse shows a standing figure with a trident (Neptune?). S C either side. 27-28mm. The colour is wrong, but a toned example (I have one) may be deceptive. 14. LEONTINI (GREEK) 500-466 B.C. 25-27 MM. Lion's head to R, mouth open. Four oval elements (lamps?) around. Letters O and a reversed N at 5-6 o'clock. Could fool the untrained eye. 15. EGYPT (GREEK) 205-180 B.C. 30mm. Crude cornucopia and wreaths drooping either side. Garbled Greek letters ARSINOHS FIDALEAFOU (Roman L!). The untrained eye may be fooled, but the garbled letters and the thinness of the characters should give it away. 16. KNIFE MONEY 1027-479 B.C. 55 x 8 mm at largest points. The size is the main giveaway, as originals of this type were in the order of 150-160mm, and bronze. Hole at the end of the handle, and five seal-type characters along the blade. As always, buyer beware, and I hope that these details will assist when readers are confronted with any of these items.